The DuChateau Heritage Timber Edition floors are manufactured to replicate historical structures and the patina of well-worn and reclaimed materials. Wood flooring that beautifully replicates the characteristics of recycled woods with accurate distressing, scraping, notching, saw marks and nail holes from real salvaged woods. The Heritage Timber Edition is the perfect combination of old style architectural qualities with modern production of FSC-certified wood flooring. The Heritage Timber Edition styles include: Lintel, Slat, Trestle, and Coal, and each of these has distinctive finishing, color, and styles to fit your home decor. Heritage Timber Edition Trestle style adds great warmth to interiors. Each of the styles has its own particular color range in the DuChateau Heritage Timber Edition. For instance, Lintel is a light-colored floor while Coal is a richer, coffee toned flooring. All of the Heritage Timber Edition floors have the same basic construction of a European Oak species hardwood floor. Like all DuChateau floors, it is an engineered floor and uses a Hard-Wax Oil for the surface instead of a chemical polyurethane finish. The Lintel has a Janka rating of 1360. 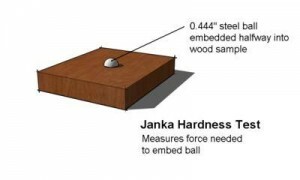 The Janka hardness test measures the resistance of a sample of wood to denting and wear. It measures the force required to embed an 11.28 mm (.444 in) steel ball into wood to half the ball’s diameter. This method leaves an indentation. A common use of Janka hardness ratings is to determine whether a species is suitable for use as flooring. Lintel, and the other floors in the Heritage Timber Collection is suitable to use with radiant heating and can be installed with a variety of methods ranging from nail-down to floating floor. The engineered wood for Lintel is straight, long grain from trees cut from large stands. The wood’s texture is coarse and characterized by open pores. Wood harvested from the northeastern areas of the species’ distribution zone tends to be denser and tougher while wood from the central regions tends to be straighter and more uniform. All hardwoods in the Heritage Timber Edition come with a Lifetime Structural, 25-Year residential finish and 3-Year commercial finish warranty. Although custom sizes are available the common construction specs for Lintel has a overall thickness of 5/8″, a top layer thickness of 1/6″, length of 72″ and width of 7-7/16″. These come with a 3-ply construction. Remember, the DuChateau Heritage Timber Edition hardwood floors feature aged character grade wood, which highlights the wood’s natural free-forming grain patterns, knots and cracks reminiscent of an old world floor. If you prefer minimal knots and cracks, please see DuChateau’s selection of select grade floors, which keep to a smooth, even, modern surface without any distressing. 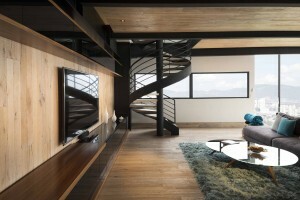 Heritage Timber Edition in Coal is a rich, luxurious hardwood.